Here is an opportunity to own one of the first front wheel drive cars made in North America. In 1929 Cord introduced the L-29 which was the first American front wheel drive car and ending in 1937 with the 812 Cord. Truly a car ahead of its time in design and styling and with only 3000 of the 810 and 812 Cords produced. This would be a unique chance to own a vehicle so rare. One of the many interesting features this car has is the hidden headlamps. 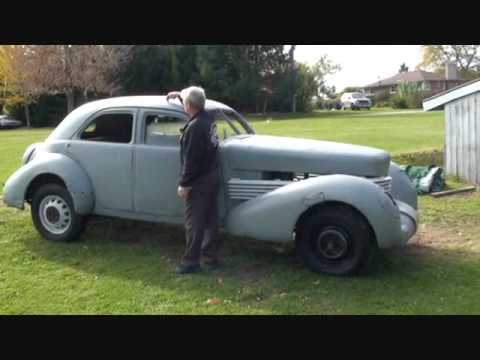 The seller has several other Cord bodies, three complete interiors, four engines, and numerous NOS parts all for sale. You can either restore this car to its original condition or customize it and have the most unique hot rod at your favourite car show or cruise-in. If you would like to find out more about this car please use the contact button for 1929fordhotrod.com or you can call me via Skype using the “Call Me” on the right side of the main page of this site. All messages will be referred to the owner of the car.